A key aspect for smooth traction operation is to safeguard electrical safety. This issue applies equally to railway systems, service buildings as well as to trains and carriages. In locomotives, high-speed trains, dining cars and other railway vehicles it is therefore important to install a safe supply of power that also has high availability. Among other issues, this is also the reason why the IT system is used in this application as an insulated supply of electrical power with insulation monitoring. Shock and vibration requirements are particularly important. They are divided into different classes as a function of the installation location in the train. In addition, very different voltages must also be monitored. The range here stretches from DC 24 V to 3AC 440 V. It is also necessary to measure the impedance and therefore determine the system leakage capacitance to PE in some applications. 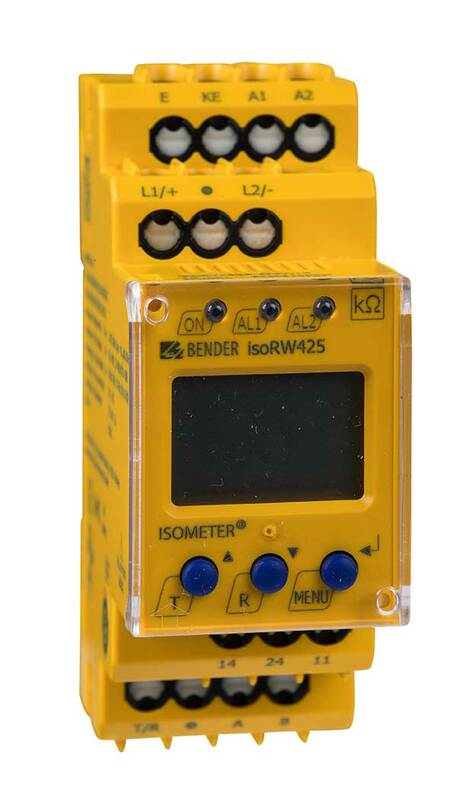 The need to take into account all the many, to some extent country-specific, requirements in international enquiries and to meet these requirements "as far as possible with one item of equipment" is a real challenge that Bender addressed with the development of the insulation monitoring device ISOMETER® isoRW425 with the proven AMP measuring principle, as well as the PCP measuring principle. The result is a very compact insulation monitoring device that monitors the insulation resistance of unearthed 0…500 V AC/DC control circuits (IT systems). DC components present in AC/DC systems do not influence the operating characteristics. A separate power supply means de-energised systems can also be monitored. The isoRW425 complies with the requirements of the device standards: DIN EN 61557-8 (VDE 0413-8), IEC 61557-8 and EN 50155. Along with railway application the isoRW425 can also be used in AC control circuits in industry, mechanical engineering, power stations, elevators and automation systems in accordance with EN 50155 as well as in AC control and auxiliary circuits in accordance with DIN EN 60204-1 “Electrical equipment of machines”, IEC 60204-1, EN 60204-1.